This pic is of me and my lovely niece, Mia. I just love my girl! I've been a busy bee. In the last month I have been to youth convention in Stockton, to visit my mom for her birthday, celebrated my birthday and Ethan's birthday. It's been non-stop fun! My wonderful friends took me out for an evening filled with dinner at Nola's in Palo Alto and ended the night at the musical, the King and I. From the bottom of my heart, I am so grateful for my friends. It's a wonderful thing to be loved! This darling little boy makes me smile! This little big boy makes me smile too - Ethan is 4 - Happy Birthday, Baby! I baked up a treat for Ethan's birthday: Dino cakes! Birthday Night! Love me some friends! Last but not least, I want to thank my hubby - He gave me the ultimate gift on my birthday - a plane ticket to New York to celebrate the lovely Kellee Hopper's day of birth! I am excited, but will be over the top excited once I am safely on the ground - I HATE to fly! It's gonna be an adventure. I promise to post pics when we return from our trip. During one of Sis. Linville's message on Friday morning, she touched on how rather than taking our needs/trials/heartaches to the Lord, we turn to other sources to unload our burdens, i.e. a friend/relative, a good book, money, an addiction, etc. These are all temporary solutions that never fulfills the need. God wants to be our help in the time of need. He is the ultimate solution to our problems. He may not fix it the way we want Him to, but He always does it right. I can totally relate to this. Too many times I have been guilty of turning to other sources to "vent" when I should be approaching THE SOURCE all along. What a simple, but life-changing message this was for me. Now, if I could just apply this to my everyday life, I know the Lord will work miracles for me. I totally enjoyed spending time with Kelly and Chasity as well as seeing friends I don't get to chat with very often. We laughed together, cried together, shopped and ate together! There is nothing better, really. I greatly appreciate Ladies Conference, and am totally looking forward to next year! Meet Belle - She is my lovely mannequin that will assist me in my display for Western District Ladies Conference next week. She will also assist me in the near future in Ebay/Etsy listings. I decided she needed something pink since everything in my house has a touch of pink. Therefore, I attempted to make a tutu skirt for her. I did a little bit of research, and although I did not have the time or energy to be very thorough, I thought the skirt came out quite nice. Let me know what you think. If you plan on attending ladies conference in Sacramento, please stop by and say hello. Need a faith boost? Well I sure do and then some! Today as I was browsing through Facebook (my new addiction) I came across a link on a friend's Facebook page. This was a blast from the past for me. We used to shout and dance when the choir would sing this song and never had a care about a fallen hair-do or perfect clothes. Did I ever get encouraged! I clicked on the link, turned up the volume, and Ethan and I danced all around the living room like wild Indians. Take that, devil! HE WILL make it alright! For those of you that may be going through it, coming out of it, or heading into it, this is for you! 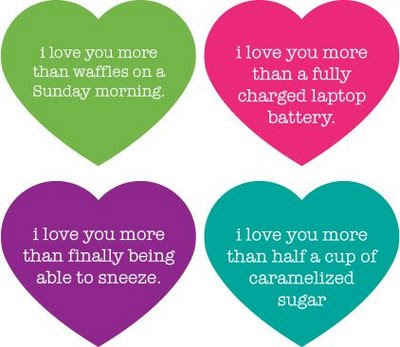 I Love You More Than . . . . .
To my charming husband I would say: I love you more than you love your new iPhone! So now it's your turn. How much more do you love your valentine? Post it here for a fun read! To here. . . .
To here all in a year! Jon-Paul is a precious little boy with some attitude thrown in. I can't wait to see how his personality unfolds. Time will tell. He is not yet walking, but getting everywhere FAST. I'm sure it won't be long before I am chasing him at church as he catches up with his big brother, Ethan. To Jon-Paul: We love you baby boy. You have made our lives more complete! Happy Birthday to you! A few weeks ago, my dear friend, Chasity Herman, was diagnosed with thyroid cancer. She is a beautiful young mother of two small babies under two and wife to one lucky husband. The doctors informed her that if she could choose any cancer, this would be the one to choose as it is beatable, even more so than skin cancer. We were all relieved to hear that. This morning, as I type this, she is undergoing surgery for the thyroid cancer. Please hold her and her family up in prayer for a safe surgery, and a smooth recovery. The doctor did inform her that recovery might not be so nice. Nevertheless, if any of you personally know Chasity, she has weathered some very large storms the last four years. I won't go into detail, but trust me, she knows what it is like to suffer. The beauty of Chasity's story, is every time a storm has came her way, she weathered it with amazing GRACE. Even during this latest cancer scare she sat down with me late one night to explain everything about it, because it was a subject that none of us could talk about. Her optimism and unshakable faith in God is amazing and beautiful. I believe this is just one more trial she will come out of as pure as gold. If I could be half as strong as Chasity, I know I could make it too. How you climb up the mountain is just as important as how you get down the mountain. And, so it is with life, which for many of us becomes one big gigantic test followed by one big gigantic lesson. In the end, it all comes down to one word. GRACE. It's how you accept winning and losing, good luck and bad luck, the darkness and light. This made me think of dear Chasity. She is going through one big gigantic test, but she doing it with Amazing Grace. I love you, Chas. We are praying. God has His hand on you. I am a devoted wife and mother of two little boys. I am actively involved with my husband in our church. I hope you enjoy my thoughts and ramblings on life, family, friends and God. My Brother's Graphic Design Co.